Many of us recognize the astonishing way in which success seems to be beyond our reach. Every time we think we can grab it, results or success simply takes a few steps back and we’re left reaching for thin air. After several such futile attempts, we’re left with no other option but to turn around and walk away, telling ourselves dejectedly that, maybe, success wasn’t meant for us. Do you really want to walk away? Looking for ways to succeed in life? You’ve landed up at the right place! Have you heard of the Will-o’-the-wisp? These mythical creatures, appearing as light blue flames, are seen by travelers as they pass through forests. They dance just out of reach, flickering in and out of sight, leading people on a merry dance through the swampland. Forever elusive, the will-o-the-wisps have been known to drive men over the edge, men who undertook a mad pursuit to catch them … and failed. In many ways, success is like that. Many of us recognize the tantalizing way in which it seems to be forever beyond our grasp. Every time we think we can make a grab for it, success coyly takes a few steps back and we’re left reaching for thin air. After several such futile attempts, we’re left with no other option but to turn around and walk away, telling ourselves dejectedly that, maybe, success wasn’t meant for us. I’ve been where you are – on the verge of almost giving up. I’ve lost hope and the will to strive. I’ve dismissed success as a myth, reserved only for those who had a lot of money or fortunate individuals luck smiled upon. I’ve known despair and I’ve gotten angry at my miserable fate. I’ve shouted sour grapes and declared success to be a fickle friend who would eventually leave you for someone else. After all that berating, I am here to tell you that success is not some unattainable goal. It’s not a whimsical demand from life, and it’s certainly not something that will happen suddenly or overnight. Success is a test of your patience, your willpower, and your strength. But for all that, success is a reality that can be achieved, but you’ve got to go after it with passion and have a strategy in place. We all think of success as something magical, something intangible. Instead, let’s call it a journey; a journey with a road-map, a path, milestones, and a destination. And like every other journey, you have got to plan everything, right down to the smallest detail or you’re going to find yourself stranded at airports or settling for third-rate hotels because all the good ones were booked in advance. There’s one thing I’d like to clarify here – I do not believe that there is only one road to success. Each individual has to undertake the journey in a way that suits him best. Let’s say you want to take a trip to DC. Now, you can reach there by train, plane, car, or bike. Regardless of how you choose to travel, there are certain things you will have to do, like plan a budget and book the hotel room. Here are the 7 steps to results that will astound you. It’s time to embark on a journey. Won’t you join me? Take responsibility for your life? What does that even mean? Aren’t we already bogged down by an astounding amount of responsibility in our lives? How can we possibly be more responsible? : From the grouchy boss to the demanding spouse to bad government policies to fair weather friends to even God, nobody is to be blamed for the way your life turned out. It’s your life and its control lies in your hands. Stop playing the victim and become conscious creators of your own destiny. : You cannot swim if you’ve got a stone tied to your feet. You cannot lose weight if you can’t curb your sweet tooth and binging habits. Get rid of old habits if they’re impeding your movement, or you can forget about moving ahead in life altogether. We like to explain our regrets and failure by saying that we had no choice. That’s a lame ploy to absolve ourselves of accountability and moving the outcome of our decision to some unknown factor. Bad habit. This kind of escapism will never serve you well and should not be entertained. Long story short, of the 7 steps to results that will change your life, taking responsibility for your life is important. Without it, progress is difficult. And without progress, you cannot make any headway towards success. So step 1, be responsible for your destiny and you’ll finally have the opportunity of changing it. Our journey has just started and it promises to be a fulfilling one. It’s time we move on to the next milestone, the next of the 7 steps to results, which is ‘Setting your goals’. Make sure you check out my next blog that outlines this step in detail. 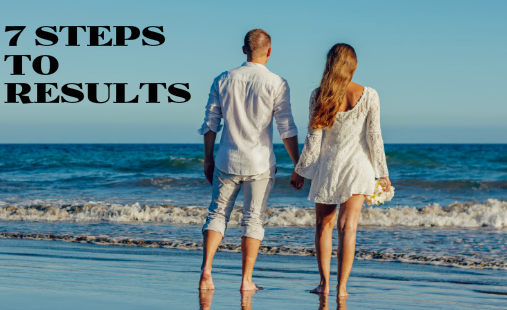 Before I go, here is a small tip, a valuable tip: Why don’t you check out this amazing and practical 7 Steps to Results Guide. 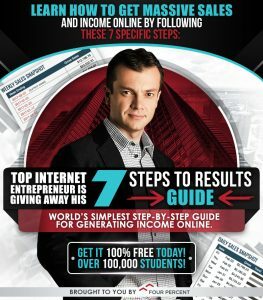 It has helped around 100,000 average, ordinary people across the globe create their own success stories and earn up to $500 a day, some even more. You can start your journey to success in the next 15 minutes! And you know what, it is 100% FREE! Unbelievable, but true. Start you success journey today! Previous Previous post: You Were Born Rich, Are You?